All you need is Love and in this case there is lots of Love in the Air as I feature some fun, cute Kids Valentine Treats! So, welcome to this months OSAT Blog Hop – All You Need is Love! Every month on the 2nd Thursday of each month starting at 6:30 AM EST, we feature a new theme. Make certain you visit all the blogs on this months hop for some great “Love” themed projects. Do you need a cute and quick kids Valentine? Well, I totally forgot that today is my son’s First Grade Valentine Party and I had NOTHING ready as of yesterday afternoon. Then, I decided I needed a cute non-candy Valentine for his First Grade teacher. Read on for details! While at Aqua Zumba Tuesday morning, I remembered that my son needed 22 Valentines for his class party. OOPS! I had no idea what I was going to make. This meant a trip to the grocery store and a search of Pinterest. I came up with a few ideas but nothing was “clicking” so I ended up with some Hershey Kisses and Air Head Candy. I knew I wanted a cute, fun Kids Valentine! The Lift Me Up Stamp Set was perfect for this project with the fun Hot Air Balloon because KIDS love balloons and then there is the fun play of words with the Air Head candy. Even though I only needed 22 cards, I made extras because I’m certain I’ll find a use for them! Whisper White Card Base cut to 6″x 3″, scored and folded in half. Using the Sealed With Love Stamp Set, use the “Swoosh” stamp and stamp with So Saffron three times on the card layer. Stamp the Hot Air Balloon with Dapper Denim Ink and die cut with coordinating Up & Away Thinlit die. Using Real Red Classic Ink, stamp the sentiment on the card layer in the bottom right corner leaving room for the “head” to be added. Assemble the 3 x 3 Note Card by attaching the cloud with Stampin’ Dimensionals just above the sentiment then add the Hot Air Balloon with more Stampin’ Dimensionals. Add the stamped “head” to the top layer. 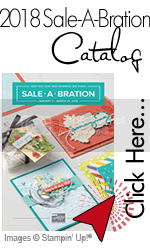 Attach the top card layer to the card base with more Stampin’ Dimensionals. For my 3D project, I’m sharing this cute box that holds an EOS Lip Balm. This box is inspired by Pootles. It really is easy and quick to make. While shopping for the candy, I grabbed several EOS Lip Balms in the checkout lane. Caleb has 2 teachers and 1 teachers assistant. I enjoy creating fun gifts for them to enjoy. BOX – 6×6″ Scored at 2″ on ALL sides then cut out each corner section of the box. For additional interest, use the corner rounder to round the corners of each box wing. LID – 4×4″ Scored at 15/16″ on ALL sides (I scored just shy of the 1″ mark so the lid fit better). Extra panels for inside measure 1-3/4″ Square. I used the Sending Love Designer Series Paper Stack for the box decorations and the box is tied shut using the Sending Love Ribbon Combo Pack. For the next blog in the OSAT Blog Hop –All You Need is Love, you’ll want to visit Melissa Davies! I’m certain you’ll enjoy the projects she has to share with you! To view her blog, you can click on her name or the NEXT button below. Fun gifts for the kids! Super cute – love your PUN on the Airheads too! This is my favorite stamp from the Occasions catalog! Great job! Both are adorable! Great projects! Pam, those little Love is in the Air Head cards are just so stinkin’ cute and I adore your EOS lip balm box! I am totally going to steal your box idea for those since my granddaughters love them so much!